Recruiting at a New Year’s Eve Party—Tacky? The best recruiters recognize the recruiting opportunities in any situation and when it is or isn’t appropriate to explore or exploit them. They know when an opportunity is clearly off-limits, e.g., you don’t hand out your card at funerals or join AA looking for a regional director of wine sales. But what about New Year’s Eve parties? Now that’s a grey area. But why not do it? 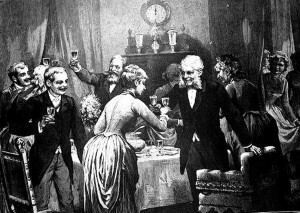 On the one hand, there is the consideration that at a typical NYE (New Year’s Eve) house party almost everyone will be in(to) good spirits—in both senses of “spirits”: The revelers will, for the most part, not only be in a festive mood, but also in a mild or greater state of inebriation and disinhibition. They will be happy or ready to be happy, relaxed and loosened/softened up, and—most importantly—in the mood to love everything and everyone associated with the moment and within ten feet of them. Like convenience-store customers suddenly realizing, while checking their ticket at the counter, that the lottery ticket in their hand has just won millions, some bubbly NYE partiers will embrace even complete strangers in a spillover effusion of joy. Basic Psychology for Dummies 101 teaches that in a situation in which someone is happy, ready to be happy, relaxed, emotionally inclusive, otherwise receptive, unguarded and loosened up—even if not also judgmentally impaired—by alcohol or other party treats, one should be alert to the possibility that a perfect sales or recruiting storm has been delivered on a party platter. As for the kind of NYE party-goer who has brought his or her cynical detachment, crippling shyness, general reluctance to attend (e.g., because of a time-conflict with a cable TV broadcast of “It’s a Wonderful Life”) or other good reason not to attend that was overridden, (s)he can nonetheless and equally present and provide an excellent lead or direct recruiting opportunity, given some skillful and customized handling on your part. On the other hand, there is the issue of good taste—or lack thereof. One school of thought deems it tacky in the extreme and very unprofessional to fish in an alcohol-laced pond stocked with unsuspecting friends and their friends. These thinkers see and enforce a sharp demarcation between the professional and the social, a line which they interpret as separating out or skimming off any possible interactions between friends or between a friend’s friend and a professional that can be one-sidedly or even mutually financially or professionally profitable. This strict demarcation of roles in terms of a social-professional dichotomy is reinforced by the implicit, equally strict, yet logically non-equivalent demarcation of situations in precisely the same terms: What is social is social; what is professional is professional, they say—a rigid partitioning that overlooks the logical possibility that professional and social roles can permissibly and harmlessly be blurred even when the situations cannot. If this non-equivalence of role and situation doesn’t compute—if you think that the situation defines the role, think again: When the counter-person at McDonald’s shares a joke with you before wishing you a nice day, has she crossed the company line that separates her work role from play or the professional/occupational situation from the realm and role of the personal? No. Quite the contrary, in fact: She is not only doing her clearly demarcated job, she is doing it superbly, albeit ambiguously. Of course, displaying personability and personality in what is supposed to be a purely business context is theoretically rationalized as “emotional labor”—personal, emotional business-promoting performances allowed or required by the job. It’s a fully-authorized blurring of roles in a strictly segregated professional situation and context. Hence, even if you rigidly equate role and situation, you may, on analogy with the McDonald’s analysis, be tempted to allow yourself to blur your roles and recruit at what is situationally clearly defined as a social NYE party by attempting to characterize it as emotional labor. But wait—not so fast. The situation of the role-blurring McDonald’s staff is different from yours as a recruiter-guest at a NYE party: She is blurring her role(s) in what is clearly a purely professional and work situation; you at a NYE party, in contrast, would be blurring your role in what the strict segregationist purists would regard as a purely social situation. However, the main point remains: Clear demarcation of situations does not entail equally clear demarcation of roles. So, that’s a liberating start. Can this liberation be taken further? Is there no generally accepted and tasteful precedent of blurring professional and social roles in a social situation? Are there none that even the most rigid role-and-situation segregationists would have to, however reluctantly, acknowledge? If there is one, it could be cited in defense of NYE party recruiting. More importantly, even if none can be cited, why shouldn’t there be any? Why should the professional and social situation rules be asymmetrical? It seems logically and psychologically peculiar to allow a blurring of roles in a clearly professional situation, yet to refuse it in a clearly social context—very peculiar indeed. Is role-blurring allowed in what are clearly work and professional situations, such as burger-buying at McDonald’s, because it softens the hard-sell premise, whereas, in clearly social situations like a NYE party, the same kind of role-blurring hardens the moment by injecting the same kind of economic motive that governs, as its raison d’être, the professional/work situation? If so, this analysis suggests that the main reason for disallowing role-blurring in social, but not professional/commercial, situations is that in these, unlike what obtains in purely professional situations, the economic motive may be ulterior, rather than obvious, defining and accepted. No one is shocked when the McDonald’s counter-person engages a customer on a quid-pro-quo commercial, economic basis; yet many will be offended by a NYE-party sales or recruitment pitch—perhaps only because of the appearance of being economically—and therefore impersonally?—manipulated. Somehow McDonald’s personalized economic manipulation is more palatable to us than NYE-party depersonalized social manipulation. On close reflection, it appears that at and as the root of this asymmetrical thinking—or bias against role-blurring in social situations—is money: Since money is a medium of exchange, it is of necessity impersonal. That’s because money’s value in no way depends on any attribute or personal characteristic of the individual or entity that possesses or wants it. Like a Mafia hit man who tells his victim “it’s nothing personal”, money is upfront about its impersonality. Whatever comparable confusion is created at the McDonald’s counter—“Is this chick into me, or my money?”—matters much less, since the initial expectation and understanding at the counter is that the interaction is clearly and primarily about money—about Gesellschaft (impersonal commercial relations) without exploitative Gesell-shafting. However, to reverse this and smuggle money considerations into the party is to appear to switch from Gemeinschaft (personal, community relations) and to commit Ge-mining for gold through Ge-mine-shafting guests through a social bait-and-switch from social to professional objectives. Return to the question of whether or not there are commonly recognized social situations in which obvious blurring of social and professional roles is allowed or perhaps even encouraged. If there are, the segregationist strictures against role-blurring in social situations will be open to an undeniable challenge. So, are there such situations that will allow economic hustling and recruiting in a clearly social situation? Consider this one—and a highly successful one at that: Amway house parties—but with the caveat that everyone knows upfront that there is going to be an Amway sales pitch. As a house party, the Amway event is clearly social—otherwise, why call it a “house party”, rather than a “house meeting”, “house sales conference” or “in-house recruitment”? Clearly, the situation is social, but with obvious and enjoyable blurring of social and professional roles as a Gemeinschaft situation is mined for Gesellschaft opportunities by the host and guests alike. Perfect. However, to repeat, this can be pulled off only if everyone understands in advance what the party is about. A former girlfriend of mine phoned me up one Sunday and pleaded with me to come to her apartment—but would not tell me why. Fearing the worst, I rushed over—like a lamb to slaughter. No, make that a lamb to auction, since I quickly discovered I was there to be sold on the idea of becoming an Amway distributor, which she herself had, unbeknownst to me, recently become. I had been scAmWaylaid. So, what’s the moral of this Amway story? It’s this: You can consider tastefully hosting your own NYE house recruitment-motivated party and theme it as a “Myway NYE Party” or “Amwaiting for you NYE Party”. Convinced this is an excellent idea, Amway is staging a massive NYE gala it calls a “celebration”, at the Grand Rapids Amway Grand Plaza Hotel. Anyone attending that Amway gala who imagines business will be the farthest thing from the minds and moves of the celebrants there must have spent his or her entire life in one of the few Arctic igloos in which Amway is unknown. …or just tell other guests that it’s your New Year’s resolution (which, in any case, will be forgotten by them as well as by you on your hung-over awakening on January 1st).